Jules: Hi, Elisha! We’re going to talk about Falling, but I know right now you’re fellow’ing as a 2016 Sendak Fellow. How’s it going? Elisha: Good morning! It’s going great. 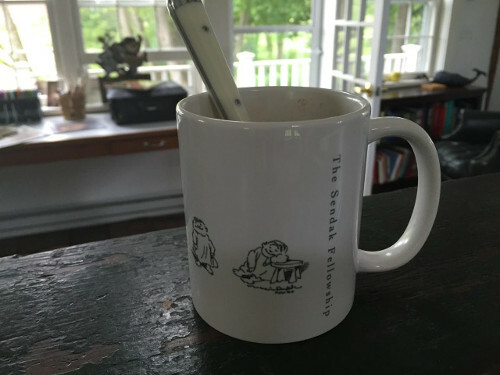 I’m in upstate New York on the Sendak farm. It’s really beautiful here. Just ran into town to get the newspaper (and saw a pheasant, a woodchuck, a bald eagle) and now am in a studio called the Corn Crib, starting my second cup of coffee. Outside I can hear goats. Jules: That looks wonderful. I had the opportunity to meet Lynn [Caponera] this past April, and she is a genuinely nice person. I heard the interview you fellows did on WAMC Northeast Public Radio [back in May] and didn’t realize till then that you have the freedom to produce nothing, while there. Are you finding inspiration by watching your fellow fellows work? Elisha: This whole place is inspiring. I think we all feel that. 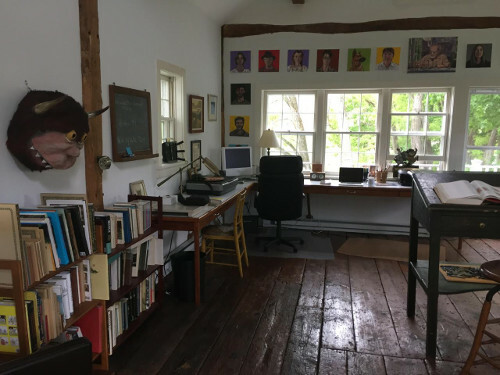 We’ve talked—me and my fellow Fellows, Yuyi Morales and Jenni Desmond—about how the freedom we’ve been given on this Sendak Fellowship actually makes us feel responsible to do good work. So, lots of sketching. Of course, being here has also given me time to read, think, prepare for the publication of Falling, go for runs, bake bread, swim in a pond that may or may not have a snapping turtle, and milk goats. Jules: I read an early copy of Falling in April on my way to Connecticut and back. I think it’s so well-written. Did you ever hesitate to write it? I’m glad you did write it, but I ask, because it’s so personal. Or did you know that it was a story you had to share? Elisha: I definitely hesitated. I’m still hesitant (though with the book coming out in days, it’s a little late for that). Because this is a book about my daughter, and her cancer, when she was quite small. As you say, personal. It’s difficult to capture all the ambiguity in just a few sentences. It would be easier to explain in person, at a table, with wine. But I do know that I love and respect my daughter completely, and it was very important that I respect her in my writing. (She and I spoke about all this before I started the book.) In the same breath, I also knew that I needed to get some of this stuff down on the page, to figure it out. Questions about worry, language, humor, art. This was a heart-rending experience, and I’m hopeful that someone who reads what I shared here will find comfort in their own lives, with whatever they’re going through. That’s the hope, at least. Again, this would all sound better in person. Jules: That makes lots of sense, even without wine. All I know is that tomorrow we will wake up and get dressed and eat breakfast. We will walk across the park to school, and in the afternoon we will go to the café and drink hot chocolate. Our bodies will take over and we will lose our minds in books and we will come home for dinner and laugh and take baths and read more books and tuck our children into bed and in the morning we will wake up and do it again. We will keep moving. Tomorrow and the tomorrow after that. The unavoidable velocity of a day. That’s to say (for my part) that sometimes, in the face of bad news or even tragedies, it’s all we can do. That time-marching-on is often all we have to hold on to. Elisha: I agree. And I’m humbled—and feel a little awkward—to have my own words quoted to me! But, thank you. I’ve been thinking about this a lot recently. I had a reading for Falling the day after Orlando, and it felt small to be reading from my small book. But then, one of the things I write about is how we keep moving, as you say. So, in the end, the reading felt oddly fitting. I read the essay about being in lower Manhattan on 9/11, how something so horrible could happen on such a beautiful day. That tension. We all respond differently to feelings of helplessness. For me, with my daughter’s cancer, there was that time-marching-on thing. Then, eventually, there was writing. Finding words that helped. Time helped, too. Of course, there was also my family, art, coffee, and lots of bad jokes. Speaking of, I like how in the book you talk about wanting your girls to understand the responsibilities that come with a life of privilege but how you also note the “tribalism” of parenting. You, that is, will give them everything you have (education, connections, etc.). “All that has been given to me I give to them. Fair or not, I put them first. I will give them everything.” There’s such a frankness to that. That you couldn’t give her, say, an immediate cure like you can give her other things must have been one of the most difficult truths, yes? I mean, it sounds like a stupid question, because of course the answer must be yes, but I would imagine, as a parent myself, that this must be distressing beyond belief. Elisha: Yes, that seems to the conundrum of parenting. Our inability to save others. This is especially acute when it’s one’s own child, but I think it’s true of any relationship. How do we help friends in need? I wish I knew. What floored me with my daughter’s illness was the complete lack of control. I felt I controlled a lot of things in my life: my books, my body when I played sports. (It’s true, I’ve been very lucky in my life.). But here was something I could not control. Again, what do we do? There are many responses to these helpless feelings — religion, family, work, chocolate. For me at least, it started with language. Using words honestly. You and I have talked a lot about this (children’s books, bad children’s books, often tell children how to be, with lots of shoulds). I think that when we are honest with our words—with children’s books or with our fears—that can start something. Not always, but often. When we use words that are true, the rest has a way of taking care of itself. There’s something about it. A pause, a breath before the end, a last chance to say something. It says, Listen, I am about to bring this piece home. A wheelhouse word used in the final sentences and paragraphs of too many books to mention. 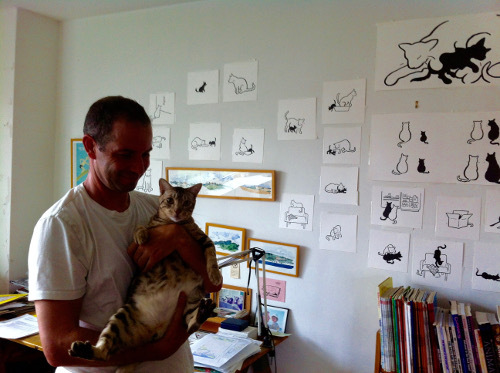 … “And” is the writer’s prayer: I have tried to communicate with you. I am not sure if I have succeeded, but please, try to understand me. Give me one last word. And. I wonder, now that some time has passed, has your philosophy of risk, as you call it in the book, with regards to parenting changed? You write about growing up with a “relaxed view of risk” and believing in the necessity of that for your own children – but then doubting yourself: “But what if my philosophy was wrong?” I think that’s another tricky thing about parenting. Oof. It’s never easy, is it? Elisha: Nope, never easy. Though I hope we can grow, and maybe things get a little easier over time (or maybe we just get forgetful). It could be because I’m a different parent. Or, parenting a five-year-old is different from parenting a teenager. 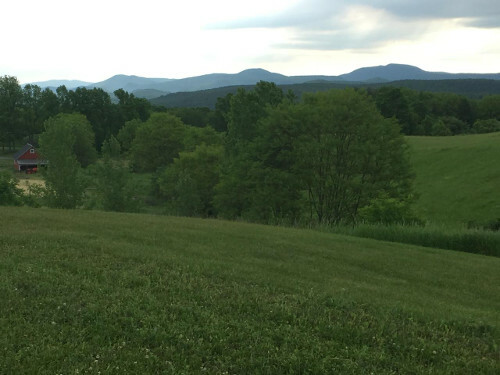 Zoë is thirteen, at summer camp and climbing mountains. She’s going to high school next year. She will increasingly encounter life on her own terms. Cancer puts life in perspective. Or, life puts life in perspective. Small worries hold less interest for me now (not that I don’t fall into them; today I’m sad, because the European soccer season ended, and my right knee hurts). But when I catch myself acting this way, I don’t like it. At my best—at all our bests, I think — we are expansive. Reaching for bigger things. Maybe that’s what the “and” is about, too. Jules: That’s a lovely thought. Reaching for bigger things. Seeing things more big-picture. I think that’s a good way to live. I’d love to wrap up by asking you specifically about children’s lit – what you’re working on now, etc. I could talk about Falling much longer, but we started this conversation quite a while ago, and because of me (and the Danielsons moving to a new house this summer), I’m slacking on its progress. So, working on any books you’re allowed to talk about now? Elisha: First, I want to say what a pleasure this conversation has been! And yes, to acknowledge what the perceptive reader will have picked up on — that this conversation started in May when I was at the Sendak farm, and continued through the summer, in Chicago and San Francisco on tour for the book (next month at Elliott Bay in Seattle, and Porter Square Books in Cambridge). All while you are moving to a new home! We’ve been busy. But maybe the episodic quality gave us time to think. So, thank you. I remember Sendak saying somewhere that he didn’t really believe in the distinction between children’s books and books for adults. These arbitrary lines we draw. (Think of Charlotte’s Web.) 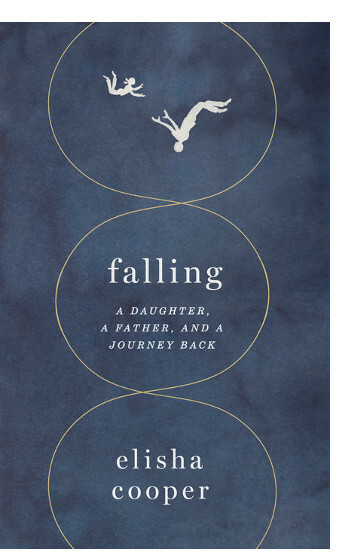 In that light, I hope Falling, even as it’s about my daughter and illness, has humor and hope and life in it. 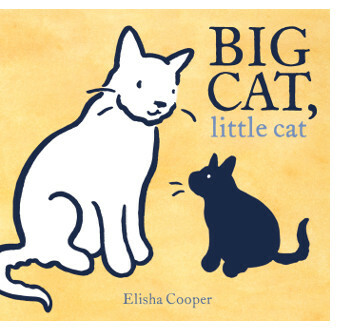 And my next children’s book—called Big Cat, Little Cat, out in early 2017 from Roaring Brook—even though it is in black-and-white, and short and simple, the issues in the book aren’t quite so simple. Or, at least, they speak to loss and love and family. I guess all these subjects get mixed up, and how could they not? The books are by the same person. All images used by permission of Elisha Cooper. I am so very happy I kept this tab open on my computer until I had a proper amount of time to completely enjoy it. I have been a fan of Elisha’s work for quite some time. I think for me this is a book to be read in small portions. I thoroughly enjoyed your conversation. Thank you both.